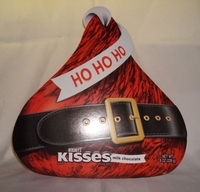 Hershey's Christmas Candy Kisses In A Kiss Shaped Box. Give some kisses this year with our Hershey's kiss shaped box of Hershey's Christmas candy. These are so cool you get a box of chocolate kisses that looks like a santa suit. This is a perfect Christmas gift for anyone on your list. Whether it is a friend, family or employee's. On the back of the box is already has a gift tag so all you have to do it fill out the to and from and you are done. No gift wrapping needed. Each box has approx 50 kisses.